Bridge Lake Park was greatly enlarged from 11 hectares as a result of the Cariboo-Chilcotin Land Use Plan Goal 2 (Special Feature) process. 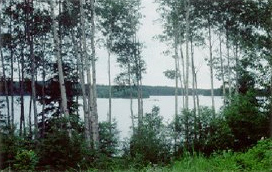 The park contains a small campground located on the south end of Bridge Lake near the community of the same name. The area is important for local recreation and resorts, which use the area as a day hiking site. Hiking, wildlife viewing and horseback riding occurs on the old logging and skid roads, which are overgrown and make excellent trails. Canoeing, swimming, boating and fishing are popular along the shoreline, which is quite open and has several small bays and inlets. The park protects a large area of undeveloped shoreline and all islands in the lake but one. The lake and adjacent stands of Douglas fir and spruce has several bald eagle nests and active beaver colonies, and provides habitat for numerous species of birds, black bear, fox, coyote, mule deer, mink and river otter. The lake contains rainbow trout, kokanee, lake char and burbot, eagerly sought by anglers. The park is located approximately 50 kilometres east of 100 Mile House. The nearest public telephone is at Bridge Lake General Store. There is no drinking water available. Due to arsenic concerns, the well used for drinking water has been decommissioned. At the south end of Bridge Lake, 51 km east of 100 Mile House; watch for signs along Hwy #24. The nearest communities, towns and cities are 100 Mile House, Sheridan Lake and Little Fort. History: Bridge Lake was established March 16, 1956 as a Class “A” park. Bridge Lake Centennial Park was established as a Class “C” park on July 23, 1958. This park was reclassified as a Class “A” park in 2003 and added to Bridge Lake Park as a second parcel. Wildlife: Fish species in Bridge Lake include rainbow, lake trout, and burbot. Bridge Lake is popular with canoeists and kayakers. Bridge Lake contains rainbow, lake trout and burbot. Anyone fishing or angling in British Columbia must have an appropriate licence. There is no roped off area for swimming at this park and there are no lifeguards on duty at provincial parks. People can enjoy waterskiing on Bridge Lake and a boat launch is available in the park. A paved single-boat launch is provided in the day-use area down at the lake. There is a small parking area for vehicles/boat trailers. This park has a day-use/picnic area with picnic tables, a pit toilet and a parking area. There are only pit toilets located throughout the campground and day-use area. This park offers vehicle accessible campsites on a first-come, first-served basis – campsite reservations are not accepted. There are 13 drive in sites, 1 of which is a double site, and 3 walk in tent areas. The camp sites are settled amongst trees and parking is available for extra vehicles in the parking lot. If staff are not around when you arrive at the campground, choose your site and pay later. Staff will be at the campground at least once a day during the camping season. The closest store and payphone are located at the Sheridan Lake Store. There are three (3) walk-in tent sites.